We are delighted to announce our continued partnership with our Brand Ambassador Seamus Harnedy for the second year running. 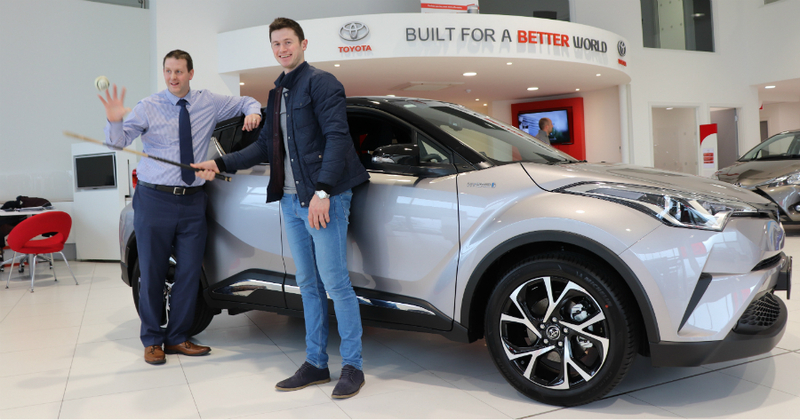 On 17th April 2018 , Lehane Motors presented a 181 Toyota C-HR to Seamus for the upcoming year. (Pictured in the photo are Paudie Donegan, General Manager, Lehane Motors & Brand Ambassador Seamus Harnedy). Seamus is the Cork Senior Hurling Captain for 2018 and he plays centre forward for the team. Harnedy made his senior championship debut during the 2013 championship, and has since won an All Star Award and won one Munster medal. All the team at Lehane Motors are extremely proud of his success and it is great to see the C-HR hybrid driving his fantastic achievements!